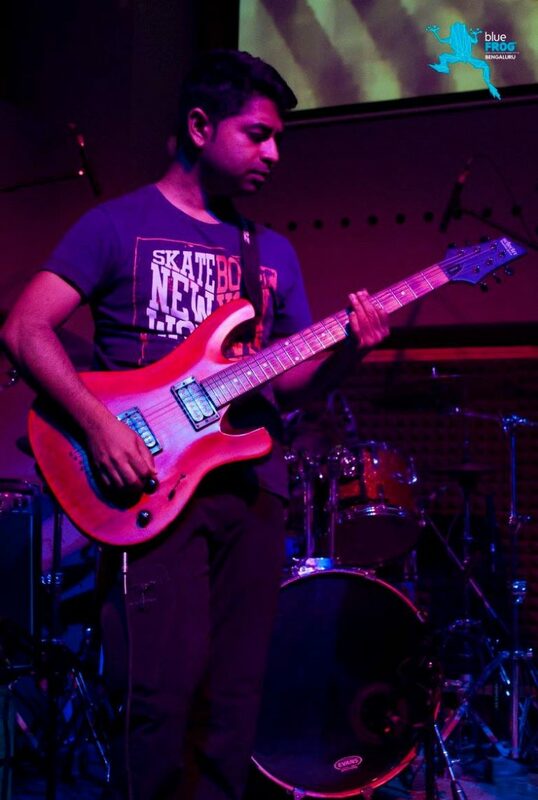 A few months ago, Korak introduced us to a new guitarist, Shounak, and a new bassist, Sricharan. This rekindled our desire to play shows again. 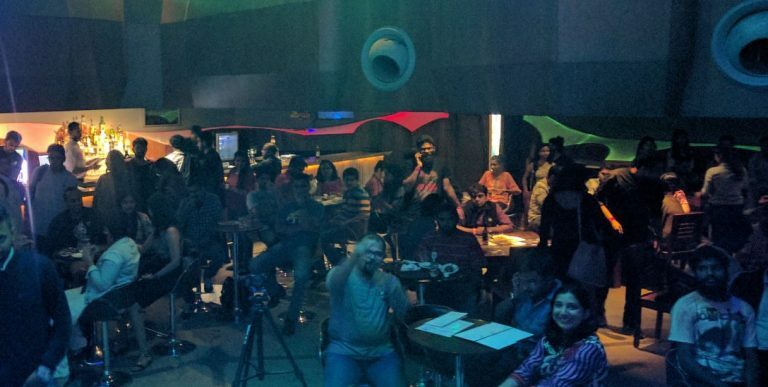 Our opportunity came via blueFROG Bangalore, who agreed to host us. We had to settle for a Thursday due to non-availability of weekend slots. I had to carry a lot of equipments. 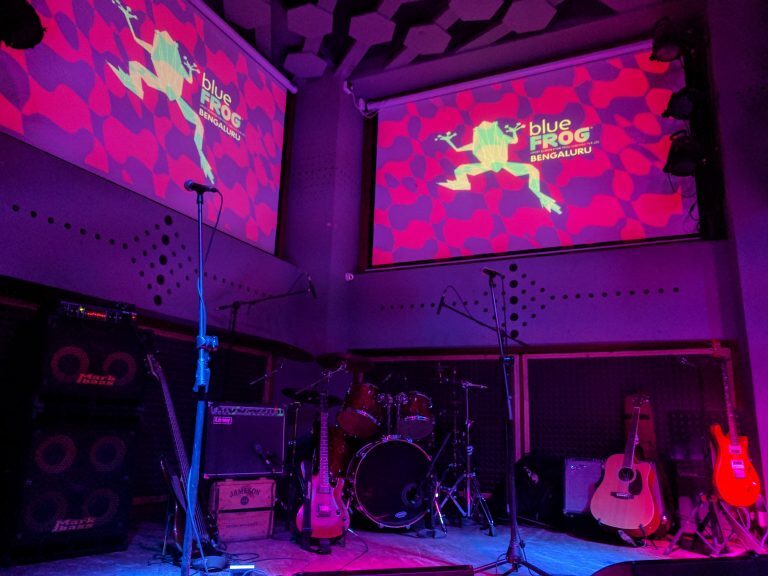 Unlike most venues, blueFROG Bangalore only has one guitar amplifier. This meant that I had to carry my guitar, my bag of pedals and my 20kg tube amp. I also carried another bag with my laptop, camera as well as a tripod to ensure that we had some videos and console audio of the show. This is usually not a problem as the equipment gets transported in a car. I had expected the car to drop me off right in front of the venue on Church Street. 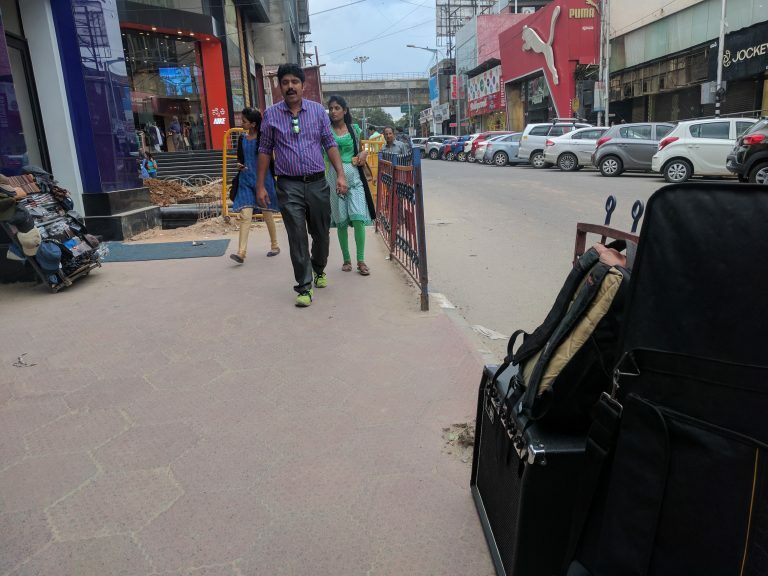 What shocked me was the fact that the entire Church Street was dug up and BBMP had put up barricades to prevent any motorised vehicle from entering. I called up Shounak and Korak, who were on the way. They advised me to get down at the junction and wait for them to arrive. That pile of mud and the metal barricades mark the entrance to Church Street. I waited for Korak and Shounak with my equipment on the pavement. The venue was about 100 meters from the junction. All three of us carried the heavy stuff (which also included another guitar, another pedalboard, another tripod, two cymbal stands and a couple of heavy cymbals) all the way to the venue. Once we were inside, we started setting up our gears. 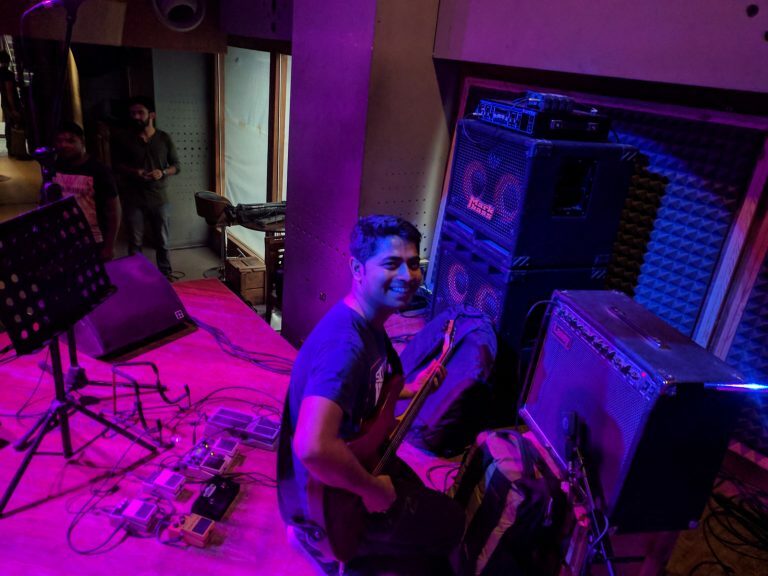 The resident sound engineer, Mriganka Baruah, was a folk musician himself and had a long history of playing and doing live audio and visuals. Mriganka equalising Korak’s drumkit on the console placed on the upper floor of the venue. He was very patient with us and took his own sweet time to dial-in the sounds for all the instruments. Personally, I am yet to see a more patient sound engineer. 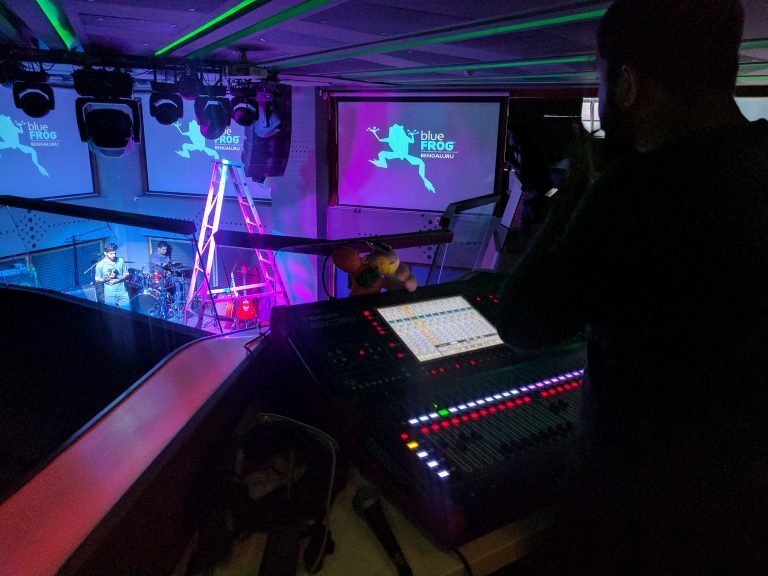 He asked us to run through all our patches and balanced the PA and the monitor mix. Shounak has a very keen sense of sound and kept giving him feedback from the lower floor of the venue. Me, setting up the tones on my amp. This was also the first time that I was using my own amp in a live scenario. The familiarity with the entire chain of equipment was a bonus as I had some of the best tones I have ever had on stage. The empty stage after the soundcheck. At about 9 O’Clock, we went on stage. We played our twelve song setlist and finished at 11 O’Clock (including a small 15 minute break in between). I felt like we did very well considering the fact that we took a four-and-a-half year break. Judging from the feedback I had from my friends, we played a very tight show. And a shot of me. 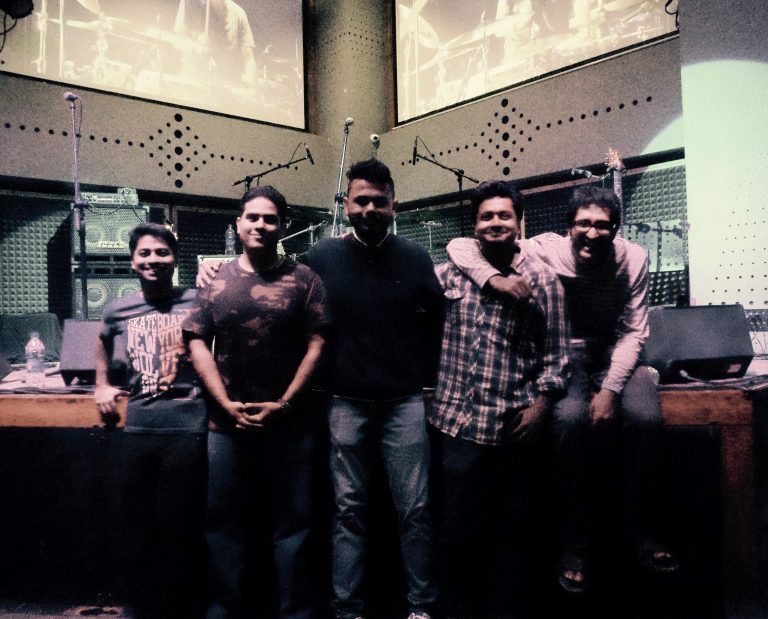 Courtesy: blueFROG. What made the day extra special was that we had about a hundred people turn up. 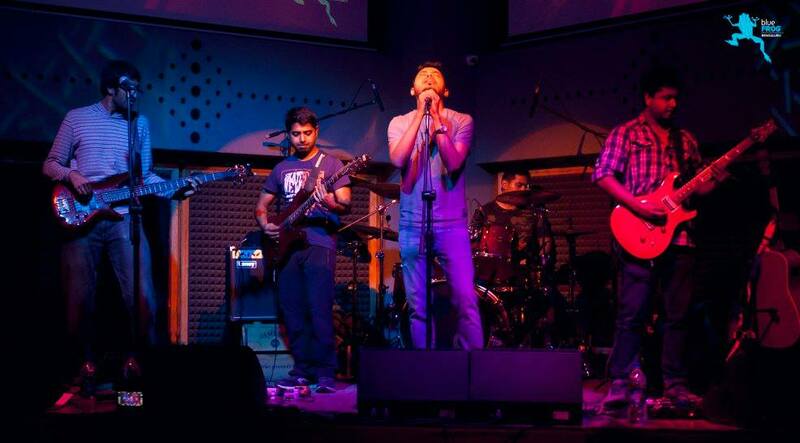 They had braved a weekday Bangalore traffic, a dug-up Church Street and a late evening drizzle to attend this event. I have nothing but a sense of deep gratitude for the audience. Here’s a thumbs up to all of you. After the show we took a few pics and had our dinner. By the time I reached home, it was already close to 1 O’Clock. That was an evening well worth the effort!